I left Junction Square, the latest place to be for Yangon’s youth, and set out walking toward the House of Memories. Several years ago, it would have been unthinkable to use smart phones and GPS to navigate our way to a destination, as we do now. Although these tools are convenient, they may have eliminated the enjoyable experience for lost tourists like myself of clumsily asking the way in a language difficult for the locals to understand. A Japanese acquaintance who runs a travel agency and I decided to meet up; it was his recommendation to visit the House of Memories. I knew about this place from Japanese TV and other sources, and so I had always wanted to visit there. This Western-style building made of teak used to be the headquarters of General Aung San’s Burma Independence Army. Now it has been transformed into a famous restaurant popular for the traditional Burmese cuisine they serve; it has even been featured on Japanese TV programs and in other media. After about 20 minutes of walking, the navigator suggested I turn left. For such a well-known restaurant I couldn’t find any kind of signboard. Nevertheless, I kept following the navigator, entered a side street and went a little further down to find an elegant building nestled in the back area. I had an hour until I was meant to meet my friend. When I explained my situation to the waiter, he understood and led me up to the second floor. 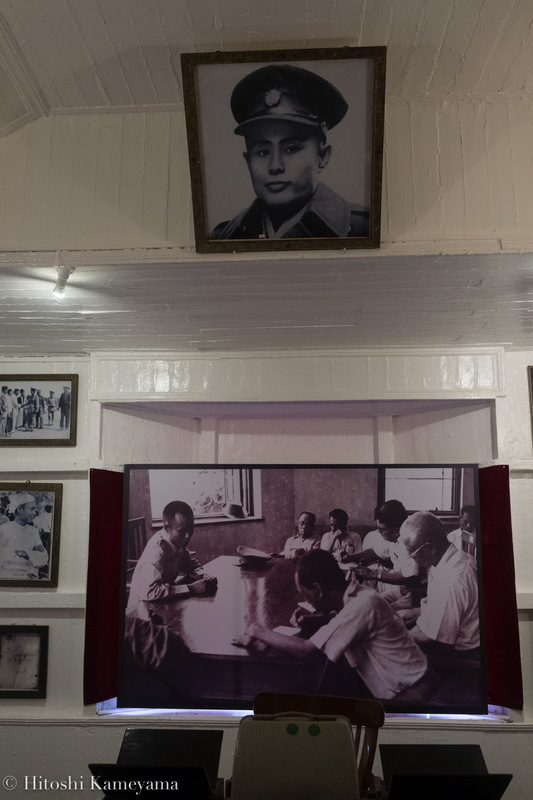 This was once the office that General Aung San actually used during World War II, which is now open to the public. Upon entering, I saw an old typewriter on top of a large desk, and behind the desk was a chair with presence. When I sat in it, my eyes were drawn to a portrait of the famous general, gazing at me with a soft and welcoming expression. Hanging on the walls were various pictures and documents that gave a glimpse of the life of General Aung San, who was assassinated midway through Burma’s fight for independence. Among the photos were family portraits taken during the childhood of the General’s daughter Aung San Suu Kyi, who led Myanmar on its path to becoming the democratic nation it now is. They looked like any ordinary photos of a happy family. It was probably impossible to imagine at the time these photos were taken that this father and his daughter would go on to lead such tumultuous lives guiding their nation. Myanmar is now opening up to the world, as it embarks on a path to development. I will pay continuous attention to how Myanmar progresses on this path while addressing the various issues it faces both within the country and abroad. Myanmarese Singer Song Writer Ah Moon.